What are 2017's B2B social media marketing challenges? It seems in 2017 the one thing we can be certain of is change. Nowhere is this felt more than in the areas of your business that are reliant on, or intricately tied to, technology. Marketing, in particular, has become more centred around technology in recent years and has been undergoing radical change. And perhaps the most changeable digital channel for marketing is social media, which is more relevant than ever to B2B businesses. A 2016 B2B Buyer’s Survey shows that more than half (53 percent) of B2B buyers are turning to social media to make buying decisions and more than a third (34 percent) say they are spending more time this year than last, using social media to research vendors and solutions.Likewise, B2B marketers are increasingly turning to social media channels as a key tool for distributing content. 27 percent surveyed indicated that social media is an “indispensable” channel for content distribution in 2016. In terms of the use of social media by B2B industries, biotech, engineering, and financial services companies are in the lead. The companies in these sectors have both significant audience growth and high content engagement on social media. Machinery manufacturers are experiencing the highest audience growth. Machinery manufacturers saw an average follower growth rate of 129.02 percent. In this post, we answer some key questions about what the year ahead holds for B2B social media marketing. Every year we seem to have a new, trendy buzzword that captures the marketing industry’s attention – is there one for 2017? With new social media channels that allow for temporary content –like images and videos that get deleted either immediately or after a short period – we now have a new term in use: ephemeral content. This is content that is created and used for a brief period, before being deleted. This is seen by many as a huge growth area this year – particularly because social media companies have launched features that support and promote ephemeral content. Commentators are pointing towards an increasing use of live video – broadcasting live to the Internet from a phone or web-linked video camera. This has become massively popular among users of Twitter, Snapchat, WhatsApp, Instagram and Facebook. However, while using these features may well be effective for B2C companies with large, young target audiences and big budgets – matched with considerable resources either in-house, through third parties, or both – this may not be the case for B2B businesses with their smaller audiences, limited resources, lesser budgets and quite different audience demographics. The return on investment really wouldn’t be there. Content marketing’s ROI depends on longevity. The longer a piece of content is useful for, and the more platforms it can be used on, the more economic it is to produce. Producing content that is only seen once, on one channel, would seem to be a poor use of resources and budget. Are there any new social channels that B2B companies should be aware of, or using now? While some of the newer channels that are being used for inbound marketing – Snapchat, WhatsApp, and Instagram, etc. – may not be significant channels for B2B marketing, it’s probably unwise to ignore them altogether. For many people out there, they are as ubiquitous as the telephone or SMS text. So, if you have the resources and your target market is using these channels, it would be beneficial to allow customers and prospects to use these new communication channels to contact you. If you haven’t the resources to do this, don’t worry too much, as it’s certainly not an industry norm to use them, but keep an eye on how they are being used by others and don’t get left behind when your competitors are offering those contact options. Media companies seem very excited by virtual reality – is there any way that B2B companies can usefully employ this technology? 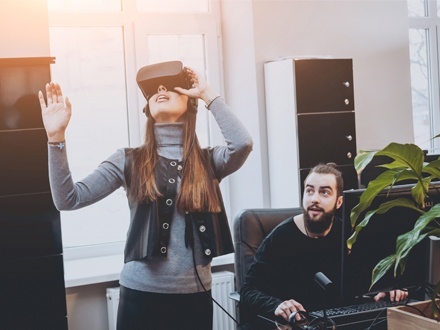 With quite usable and affordable forms of virtual reality (VR) utilising mobile phones and ”cardboard” viewers, there are opportunities for B2B companies to use the technology to good effect. When you have large, physical products, VR allows you to ”demonstrate” them without a physical presence. With a 360 VR photo, users can view the product from any angle and get a real sense of it – without having to visit a showroom or a factory. Likewise, you could showcase your production line, manufacturing systems or other aspects of your production process in VR presentations. VR can also prove a useful technology for training and support, or even for demonstrating prototypes remotely to clients over long distances. VR content might seem technically daunting to produce, but there are apps and hardware out there that simplify making 360 images and even virtual reality videos if you fancy taking the plunge. These can then be shared directly on YouTube or via other social media linked to your website. Can you still run your social campaign for free in 2017? Social media is never free, in the true sense of the word. Even if you are paying nothing for software, there is still an enormous amount of time involved in running a successful social media campaign – time which should be factored into any marketing budget. But for some channels, the free route is no longer effective. For example, Facebook earns its money through advertising, and it deliberately hobbles you if you try and do everything for free. If you have a product or company page then without advertising your posts will be seen by very small proportion of your audience – probably less than 2 percent. This makes it a poor return on time investment for most companies without an advertising budget. This situation has worsened over the years, so, in 2017, paid advertising is going to become more important to the successful use of social. With careful targeting and monitoring, paid advertising doesn’t have to be expensive – and, more importantly, you should see good returns. Is there anything companies can do to utilise social without spending a fortune? One area many companies overlook is employee advocacy. This is the idea of leveraging your workforce on social media, encouraging them to like your pages, posts, articles etc. and to comment and engage. Many voices are more powerful than one. Of course, there are issues involved with this, but these can be handled by offering training and having guidelines in place – in particular, a social media policy. Ideally, employees should be creating content and sharing too. Another important group that often gets overlooked is a company’s sales team, with many not given the tools or the content they need to be able to share with clients and prospects. Make sure your sales team is fuelled with a constant supply of links and content. With limited resources, what should a B2B company focus on? Limited resources are an issue for B2B marketers. 56 percent of marketers that have a small (or non-existent) social presence say lack of resources is the number one reason. So, it makes sense to concentrate on the social media channel that shows the most returns. Without a doubt, the number one social media source of leads for B2B Companies is LinkedIn. A study by Content Marketing Institute and MarketingProfs in 2016 showed that 94 percent of B2B marketers used LinkedIn. It also came out on top for effectiveness. B2B marketers can connect with partners, prospects, clients and peers to build their network and pipeline. They can also target prospects based on employer, job title, location, and other criteria via LinkedIn Ads. With 414 million active users globally, there is no better social platform for creating and nurturing a B2B presence. So, LinkedIn is an area to concentrate on. For 2017, social media will continue to mutate and evolve, with new platforms and changes to existing platforms almost inevitable. However, those changes usually take time to affect marketing radically and usually impact B2C first. This means that, for B2B marketers, there should be time to identify, evaluate, test and prove any new platform or development in social media.